Pure.CSS provides a very beautiful and responsive CSS for form designing. You have to add a class name "pure-form" to <form> element for creating a form. 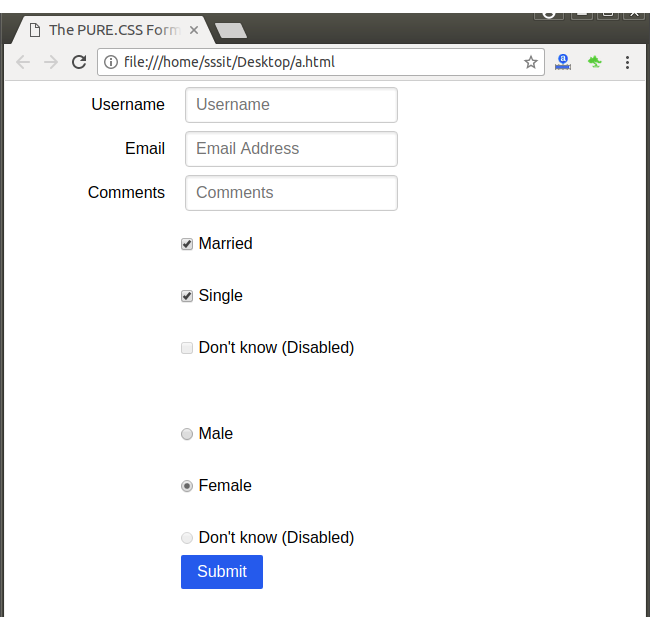 Following is a list of CSS classes which can be used to create a form with Pure. 1) pure-form It is used to specify a compact inline form. 2) pure-form-stacked It is used to represent a stacked form with input elements below the labels. it is used with pure-form. 3) pure-form-aligned it is used to represent an aligned form with input elements below the labels. to be used with pure-form. 5) pure-button It is used to beautify a button. 6) pure-checkbox It is used to beautify a checkbox. 7) pure-radio It is used to beautify a radio. Let's take an example to create a form by using the above all classes.